John and Mary Woolson, who married in 1749, were among Mount Holly's early Quaker abolitionists. 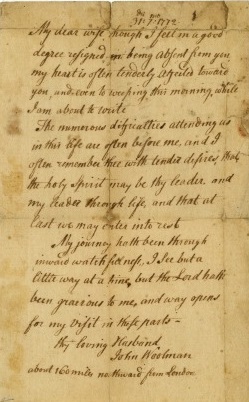 On July 31, 1772, John wrote this letter to Mary while on ministerial travels in England. 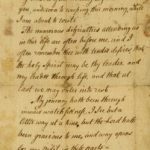 In the view of American Studies scholar Geoffrey Plank, the letter demonstrates the challenges of maintaining the Quakers' emphasis on a good family life while also serving the abolitionist cause. My dear wife though I feel in a good degree resigned in being absent from you my heart is often tenderly abjected toward you, and even to weeping this morning while I am about to write. The numerous difficulties attending us in this life are often before me, and I often remember thee with tender desires, that the Holy Spirit may be thy leader and my leader through life, and that at last we may enter into rest. My journey hath been through inward watchfulness, I see but a little way at a time, but the Lord hath been gracious to me, and way opens for my visit to these parts. While on the London trip, John Woolman died of smallpox in 1772. Sarah Woolman lived until 1787 and was buried in the Friends Burying Ground in Burlington. Mount Holly became the county seat for Burlington County through an act of legislation in 1793. 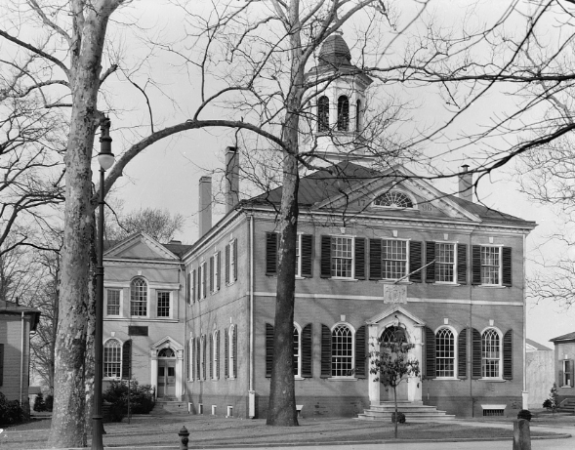 Burlington County already had a courthouse in Burlington, built in 1683, but an election in 1795 determined the site for the new building. 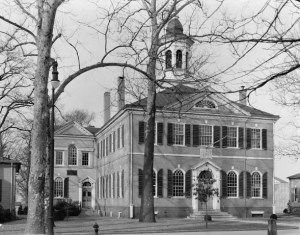 Voters chose Mount Holly over Burlington and Black Horse, and the new Burlington County Court House opened in 1796. It served official court functions until construction of a more modern facility in 1959. 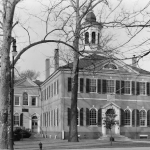 The original courthouse resembles Philadelphia’s Congress Hall, which was built in 1787-89 to serve as the county courthouse for Philadelphia. The design for the Mount Holly structure is credited to a master builder from Philadelphia, Samuel Lewis. 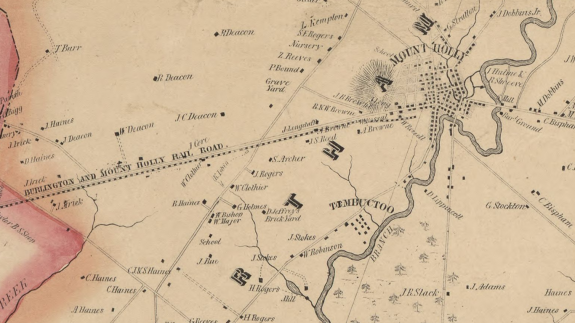 In this detail from a map of Burlington County, Mount Holly is represented as a residential center with connections to the region. The map's orientation is tilted, so that north is in the upper left corner of the map, not at the top. 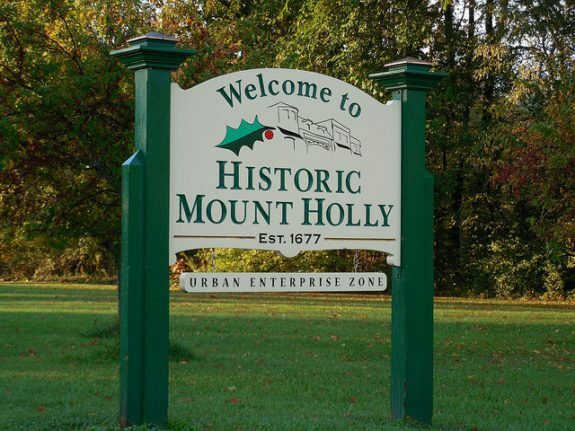 Immediately left of the town, shading indicates the holly-covered hill that inspired the name Mount Holly. 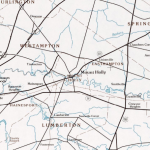 The diagonal line extending across the map is the Burlington and Mount Holly Rail Road linking the two towns. Also nearby, the map documents the presence of the free black settlement Timbuctoo. Founded in 1820, Timbuctoo was a haven for former slaves who escaped to New Jersey using the network of the Underground Railroad. Click to enlarge and explore this map in the digital collections of the Library of Congress. 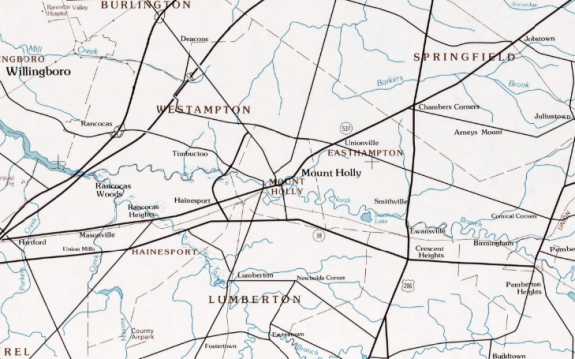 During the twentieth century, an increasing web of highways further connected Mount Holly with the region, as shown in a detail from a map published in 1986. In the South Jersey suburbs, construction of nearby shopping centers and malls, notably the Cherry Hill Mall (which opened in 1961) and the Moorestown Mall (1963) changed consumer-buying habits to the point that many small shops and family-owned businesses that had dominated the commercial landscape of downtown Mount Holly closed. Buildings representing a range of architectural styles from the eighteenth and nineteenth centuries line the streets of the Mount Holly Historic District, added to the National Register of Historic Places in 1973. Mount Holly’s proximity to the transportation hubs of Philadelphia and Camden, as well as its agricultural, canning, manufacturing, and textile industries, contributed to its economic success as a regional force by the onset of the nineteenth century. In addition its role in government as the county seat, Mount Holly developed a town center of small businesses, stores, and newspaper offices. Travel from Mount Holly to Philadelphia and Camden was made possible by ferries, stagecoach, and a rail service that started in 1867. Mount Holly, New Jersey, established by Quakers in 1677 and known variously in its early history as Northampton and Bridgetown, became the county seat for Burlington County through an act of legislation in 1793. Three years later the Burlington County Court House, similar in style to Philadelphia’s Congress Hall, opened to serve as the official county court facility, a position it held until a new building assumed those responsibilities in 1959. 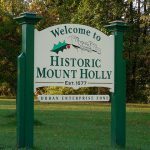 Officially renamed in 1931 as Mount Holly, the name that it had been commonly known as since the Revolutionary War, the town owed its position as county seat to its central location twenty-four miles east of Philadelphia and its agricultural and manufacturing prominence. Over time, Mount Holly played a significant, and sometimes controversial, role in the Philadelphia region, even serving as a temporary capital for New Jersey during the Revolutionary War. Mount Holly was originally home to the Lenni Lenape people, who lived in the area for over ten thousand years—long before the arrival of the Europeans in the seventeenth century. When British settlers arrived, the Lenape not only traded with them but also taught the settlers the skills necessary for frontier survival. However, these interactions brought devastation to the Lenape through diseases like smallpox and cholera, to which the Native Americans had no immunity. The indigenous people died in shockingly large numbers, so much so that by the mid-1700s only a few enclaves of the Lenape remained. The first white, English-speaking person credited with settling the area was Walter Reeves (?-1698), who arrived in 1677 to establish a plantation along the Rancocas Creek. As it flourished, it attracted other settlers who established grist and sawmills in support of the predominantly farm community, which was incorporated in 1688. The first gristmill in Mount Holly was built in 1723, and a sawmill situated on the Rancocas was built in the early 1700s. In the eighteenth century, the Rancocas Creek was dammed and water redirected for use by the farms and mills, an area later preserved as a recreational facility known as Mill Dam Park. 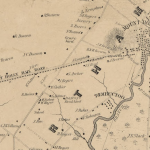 Mount Holly played a pivotal role in the Battle of Trenton during the Revolutionary War. The Battle of Iron Works Hill, also known as the battle of Mount Holly, aided General George Washington (1732-99) in his 1776 assault on Trenton by diverting a large number of Hessian troops to rout forces at Mount Holly. Over two days, December 22 and 23, 1776, a small American force of six hundred militiamen under Colonel Samuel Griffin (1746-1810) engaged some two thousand British regulars and Hessians commanded by Colonel Carl von Donop (1732-77). In addition to the indigenous people and the European settlers, people of color played important roles in developing the region. The African American presence in New Jersey, including the area that encompassed Mount Holly, extended back at least to the late seventeenth century, when slavery served as a source of labor for agriculture and industry. That practice continued until 1804, when the New Jersey legislature passed “An Act for the Gradual Abolition of Slavery.” Although this law freed children of enslaved parents when those children reached the age of majority, it did not emancipate those currently enslaved and it permitted the practice of “apprentice for life” until 1865. Members of Mount Holly’s African American and Quaker communities participated actively in the antebellum abolition movement, and Mount Holly became one of the original stops on the Underground Railroad. The town’s historic village of Timbuctoo, a community of free African Americans founded in 1820, was such a haven for escaping slaves using this network. Mount Holly’s proximity to the transportation hubs of Philadelphia and Camden, as well as its agricultural, canning, manufacturing, and textile industries, contributed to its economic success as a regional force by the onset of the nineteenth century. Among its manufacturing endeavors were Semple’s Cotton Mill (founded in 1856) and the Ridson Foundry (1847). Travel from Mount Holly to Philadelphia and Camden was made possible by ferries, stagecoach, and a rail service that started in 1867. Mount Holly’s town center hosted many small businesses and retail stores as well as newspaper offices. In the twentieth century Mount Holly’s economy received a boost from the Camp Dix army base, established in 1917 as a staging and training center for World War I and located approximately ten miles from the township. Construction of the camp involved recruiting and hiring eleven thousand workers from the area. During the 1930s the camp served as a base for members of the Civilian Conservation Corps, and in 1939 the army made it a permanent military base, Fort Dix. In 2009 the Department of Defense merged Fort Dix with McGuire Air Force base and the Lakehurst Naval Air Engineering Station to create McGuire-Dix-Lakehurst, the only tri-service joint base in the country. In 1994, Fort Dix added a low-security federal correctional institution housing over four thousand inmates to its primary mission as an induction center. As in Philadelphia and Camden, to which Mount Holly’s economy was closely tied, the latter part of the twentieth century became a period of economic decline. National trends of mills, factories, and food-processing plants relocating to less unionized states or overseas meant a loss of blue-collar and middle-class jobs and residents. After reaching a high of 13,271 residents in 1960, the town’s population fell to 9,536 in 2010. Additionally, the construction of nearby shopping centers and malls, notably the Cherry Hill Mall (which opened in 1961) and the Moorestown Mall (1963) changed consumer-buying habits to the point that many small shops and family-owned businesses that had dominated the commercial landscape of downtown Mount Holly closed. As part of a redevelopment effort, in the early twenty-first century the township designated the 320-acre Mount Holly Gardens development for demolition and reconstruction. Erected in the mid-1950s to accommodate military families at Fort Dix and McGuire at affordable prices, the community consisted of 379 garden-style apartments. The development had been a boon at a time when area housing was in demand, but problems ensued after the builder filed for bankruptcy and the project fell first into the control of a New York City real estate company and subsequently to a patchwork of absentee owners. Despite the town’s periodic efforts to enforce building codes, physical and social conditions deteriorated. By 2002, when Mount Holly authorized the project’s demolition, its affordability had attracted a mixture of lower-income owners and renters, the majority of whom were black and Latino. Contesting the town’s effort to relocate them, the Gardens’ remaining residents sued, taking their case all the way to the U.S. Supreme Court. Facing ever-mounting legal costs, Mount Holly settled the case in 2013 before the court verdict, agreeing to include units to accommodate the plaintiff’s needs in the new construction, a neighborhood called Parker Green Homes. Less contentious was Mount Holly’s promotion of investment opportunities created after the state designated it as an Urban Enterprise Zone in 1995. Using the tax incentives available through this program, Mount Holly sought to capitalize on accessibility to Philadelphia, its historic assets, and a revitalized Main Street shopping district to draw retail dollars as well as to reestablish itself as a thriving residential community. New Jersey Department of the Public Advocate. “Evicted from the American Dream: The Redevelopment of Mount Holly Gardens” (November, 2008). Plank, Geoffrey. “Sarah Woolman and the Anti-Slavery Family.” In Quakers and Their Allies in the Abolitionist Cause, 1754-1808, ed. Maurice Jackson and Susan Kozel. New York: Routledge, 2016. Rizzo, Dennis C. Mount Holly New Jersey: A Hometown Reinvented. Charleston, S.C.: The History Press, 2007. Shinn, Henry C. The History of Mount Holly. Mount Holly, NJ: Mount Holly Herald, 1977. Winzinger, Heidi J. and Smith, Mary L. Mount Holly. Charleston, S.C.: Arcadia Press, 2001. Burlington County Historical Society. 451 High Street, Burlington, N.J.
Mount Holly Historical Society, Park Drive, Mount Holly, N.J.
Rowan University Archives and Special Collections, 201 Mullica Hill Road, Glassboro, N.J.
Rutgers University Libraries Special Collections and University Archives, Alexander Library, New Brunswick, N.J.
Burlington County Court House, 1796 High Street, Mount Holly, N.J.
Burlington County Prison Museum, 128 High Street, Mount Holly, N.J.
Shinn Curtis House, 23 Washington Street, Mount Holly, N.J.
Brainerd Schoolhouse, 100 Wollner Drive, Mount Holly, N.J.
Stephen Girard House (private residence), 211 Mill Street, Mount Holly, N.J.
Battle of Iron Works Hill Site Marker and Monument, Pine Street (between Shreve Street and Hulme Street), Mount Holly, N.J.